Imagine a forest where only the sound of the birds and the breeze on the trees can be heard. Imagine a treehouse in the forest, and imagine that this place is your home for the night. Ever since I was a little girl I’ve always wanted to have a treehouse. If you’ve already checked my bucket list, you’ll know that glamping was one of the things I wanted to try. A few days ago I managed to fulfill this dream and stay in one of these treehouses. Wait… what’s glamping? Galloping literally means the combination between glamour and camping. It’s a trend among nature lovers, especially for those who do not want to give up comfort and luxury. While glamping, the focus is on experiencing the accommodation. In Cabanas do Barranco they have adapted this concept really wisely. 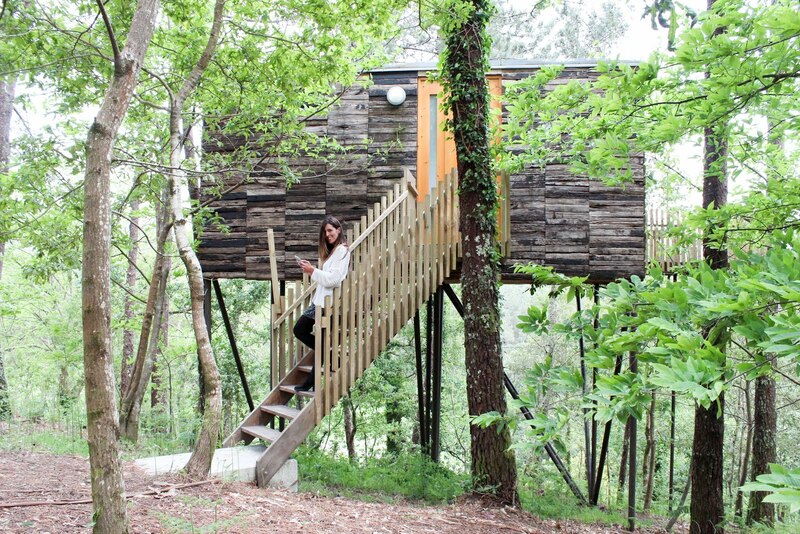 Cabañitas del Bosque: as its name suggests, these are cabins built in the trees in a beautiful forest. Cabanas de Apriscos: similar in style to Cabañitas del Bosque. Cabanas de Broña: located on the beach. Cabanas Sen Barreiras: one of the first barrier-free accommodations in Galicia. The treehouses are made with recycled wood and are fully integrated into the environment, a beautiful deciduous forest that sometimes makes it difficult to distinguish the cabins from the lush vegetation. Because of that, each cabin ensures your privacy and intimacy. The names of the cabins have also been carefully chosen, and correspond to the most emblematic coves of the estuary of Muros and Noia. 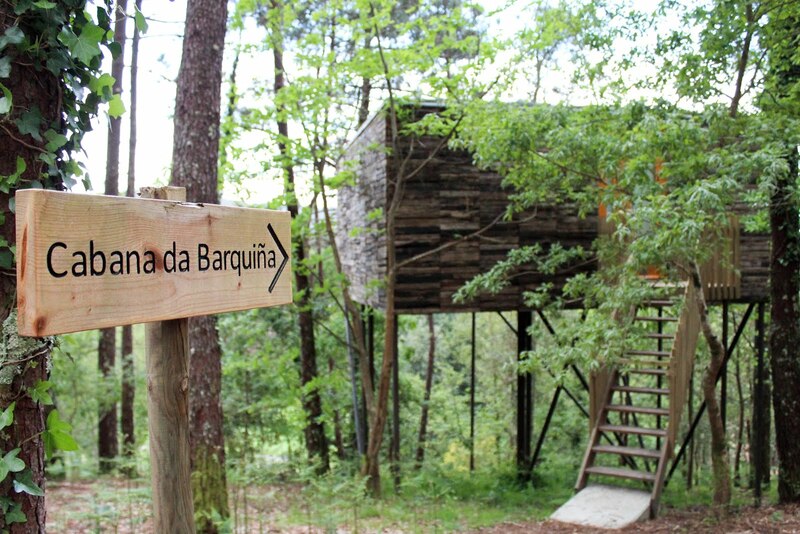 We stayed at Cabaña da Barquiña, 6 meters high, with a beautiful tree that crosses the terrace – which features a jacuzzi. 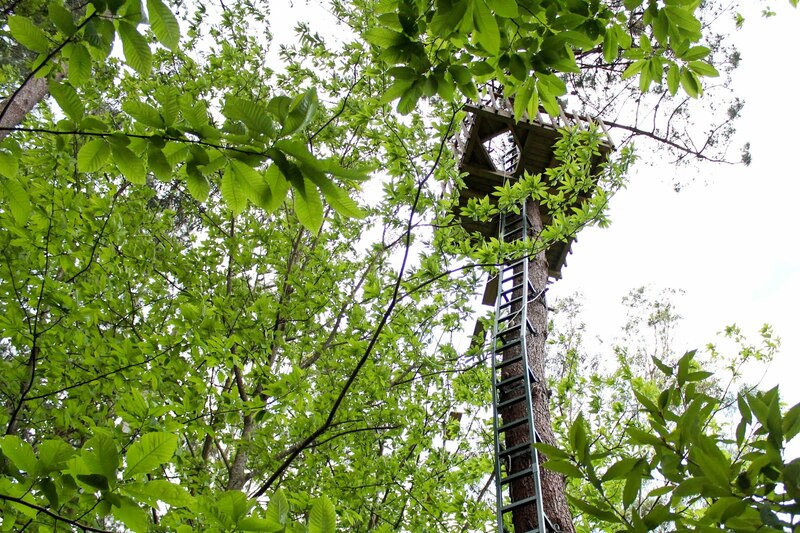 Listing the comforts of the treehouse is not an easy task. Each cabin has its own wifi, a log fire (we did not use it because aircon was more than enough), piped music (which can connect any device via USB or Bluetooth), TV and a perfectly integrated kitchen (that you can only see if you open what looks like a closet). The cabin has a hydro and chromotherapy jacuzzi on the terrace. During our stay the weather wasn’t nice enough but we got to enjoy the terrace thanks to the jacuzzi, which saved us from freezing. 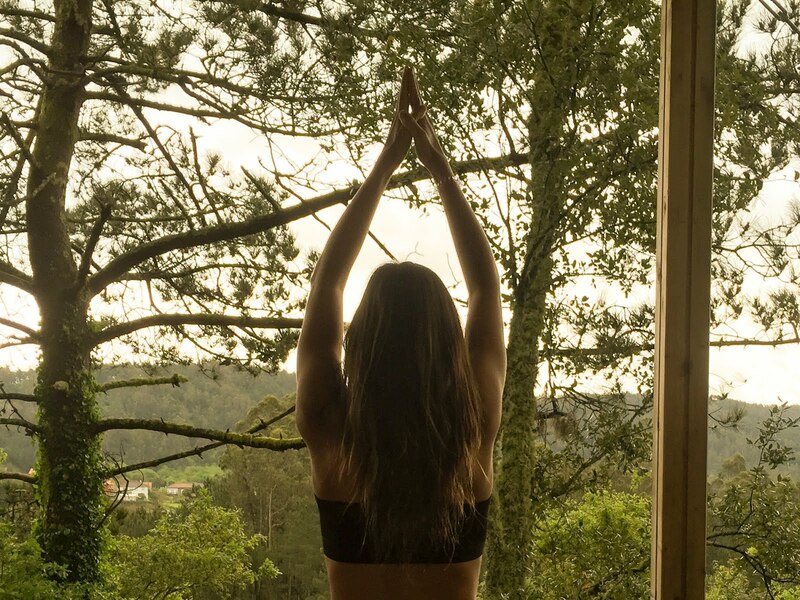 The place is all about design and comfort in such a dreamy environment that it’s perfect to connect with nature and to enjoy a romantic getaway in Galicia. The atmosphere is pure harmony. 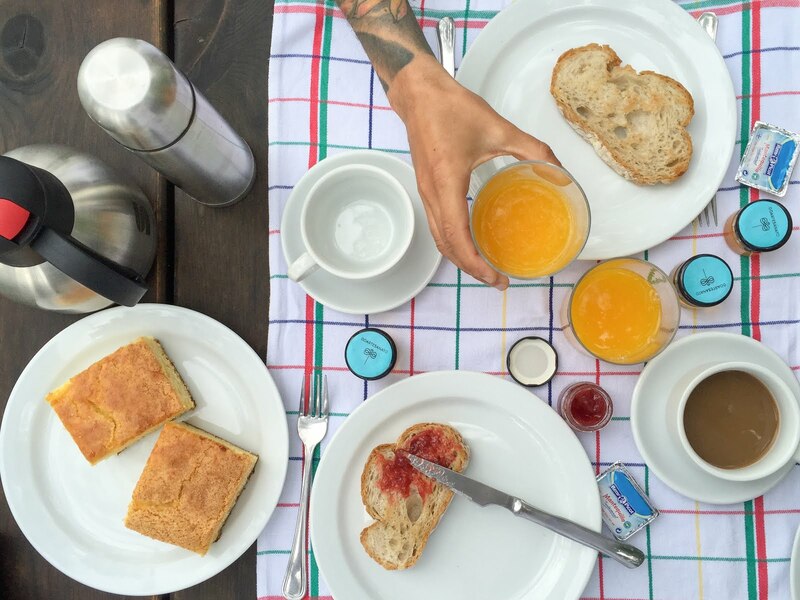 After an early morning yoga session surrounded by the trees, we got our breakfast delivered to the door. Breakfast comes in a lovely basket and includes everything you need to start your day full of energy. If you want, you can set leisure activities to do in the surrounding area, as Tibetan bridge, zip-lining or horseback riding routes. We have recently returned to the cabins. This time with a lovely weather, we decided to stay at Cabañas de Broña, which are located 400 meters away from Broña beach. Broña cabins are larger in size than Cabañitas del Bosque, featuring 2 rooms with capacity for 4 guests and a bigger kitchen and living room. It’s an amazing choice for summer days! If you would also like to live in a tree hut for a day, let me know in the comments or share this post on your social networks, maybe someone will catch the hint. Thank you for reading! I was invited by Do Artesanato to stay at their lovely properties. As usual, opinions remain my own.